A haul video is a video recording of a list and explanation of items purchased, delivered while unpacking or showcasing the purchased items. Shoppers also talk about their personal lives or other issues. Many incorporate music, titles, and notations. Videos are uploaded to sharing sites such as Youtube. I produce Youtube installations of my own "parody" haul videos, showcasing shopping hauls, often from thrift shops, speaking about my personal life and opinions, and playing noise or lo-fi albums. 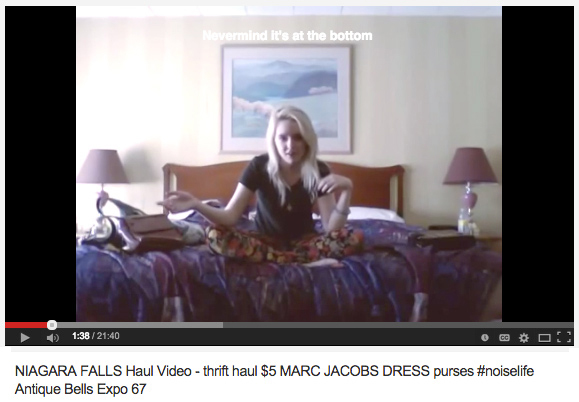 Items I have displayed in my haul videos include a Marc Jacobs dress purchased for $5 in Niagara Falls, a trio of brass bells from a roadside charity shop, CB I Hate Perfume's Cedarwood Tea purchased in New York for $55, and Keds with DIY gemstones stuck to them purchased in Winnipeg for $1. Through making the videos I attempt humour but find that it is impossible to mimic the motivations for making a haul video. The vapidity required to talk at length about one's purchases and one's motivations for acquiring items was easily tapped into. Viewers unfamiliar with the genre are compelled to underestimate and scorn haul videos as feminine displays of conspicuous consumption. 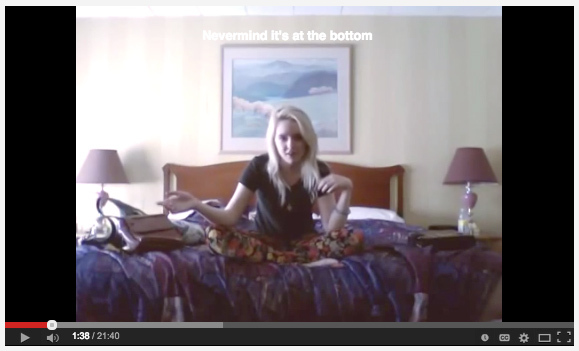 The discomfort that a haul video and its characterizing webcam gaze instills is a reminder of our inherent vanity. Humans crave opportunities to be reporters of minor and major details, and we are, within ourselves, reporting and documenting all the time. We store information and collect the details of our lives. The popularity of some haul videos is driven by the curiosity of the viewers toward the items couple with an attraction to the performance of the stranger unpacking the items — yet who pays full attention to haul videos, or watches long haul videos to completion, other than the video's maker? I witness this display of vanity vs function in my process each time I record a haul. While my attempts at parody fail, I find the haul video a valid human medium, if not a successful artistic outlet, to connect with consumption practices and motivations to acquire items, and to what we share in relation to them. Hi lovelies, I'm back but not with the video you expected! Here's a SHORT SHORT SHORT thrift haul from Meaford, Owen Sound, & the ELECTRIC ECLECTICS music festival. New haul video! Sorry I don't make many of these but here's my haul from small towns in Southern Ontario. Some things that I picked up for FALL in NEW YORK CITY. This is my second haul video, sorry it's been so long since my last one. I'm in NIAGARA FALLS. These are all items I bought while ~thrifting~. Thanks for watching my video and please subscribe to stay updated. Haul Video: Goodwill $1 Sale + Secrets + Special Feature on Micro Cassettes! Haul Video featuring items I bought at Goodwill's $1 sale February 2013 I'm so sorry I didn't post this yet :( Anyway I hope you like what I have to share today in my first ever haul video!